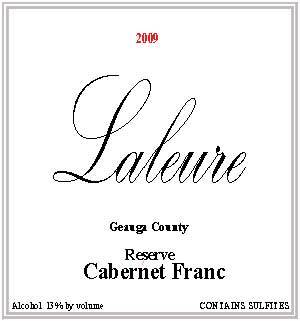 Laleure Cabernet Franc is the favorite for lovers of big red wines. Aged in American oak barrels for a minimum of 2 years, it is powerful yet smooth with soft tannins and with plenty of dark berry fruit. Laleure Pinot is changing as we move towards new winemaking technique. We continue to strive to maintain a strong presence of fruit, typically bright cherry, currant, and others depending on the year. It is aged in French oak barrels using a custom toasting profile optimized for the style wine we love. 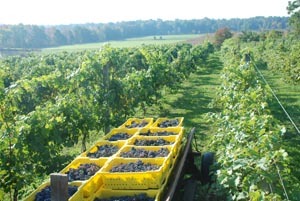 Chambourcin is a French-American varietal. It is one of the first grapes we planted at Laleure because it is well known for its winter hardiness, and it has lived up to those expectations. It has a very deep red color and when aged in American oak barrels has a rich berry flavor and is quite easy to drink despite no residual sugar. Laleure also makes a Rosé version of our Chambourcin. It is very light, reminiscent of drinking a Rosé in the countryside of Provence. Laleure Three Dog Red is a blend of primarily Pinot Noir and Cabernet Franc. The blend is chosen from aged contents to be softer and easy to drink, yet it maintains a strong presence of fruit, typically bright cherry from the pinot and dark fruit from the cabernet franc. It is typically aged in oak barrels using a custom toasting profile optimized for the style wine. Laleure makes a wide variety of chardonnays. Our chardonnay's are fully aged in French oak barrels using a custom toast profile. Some vintages are made by the sur lis method, fermented in French oak barrels. For most vintages we bottle a portion of our chardonnay without aging in oak for our customers who prefer the crisper flavor and mouthfeel. Fruit tasted in our chardonnay can be green apple, pineapple, honey, and other tropical fruit. Riesling at Laleure is a favorite. It generally has a bit over 1% residual sugar, just enough to balance the acid. Lots of fruit, honey, apple, pear depending on the vintage! Our Vignoles is preferred by our customers who like a crisp white wine. It is well balanced, crisp, and with a definite note of grapefruit at the finish. Laleure Three Dog White is a crisp white wine with significant fruit overtones of citrus fruit and pineapple. Laleure Three Dog White is a blend primarily made from Vignoles and Bianca grapes. It is made to be a bit softer than the Vignoles by controlling the level of the Bianca, yet retaining the crisp grapefruit notes of the Vignoles.